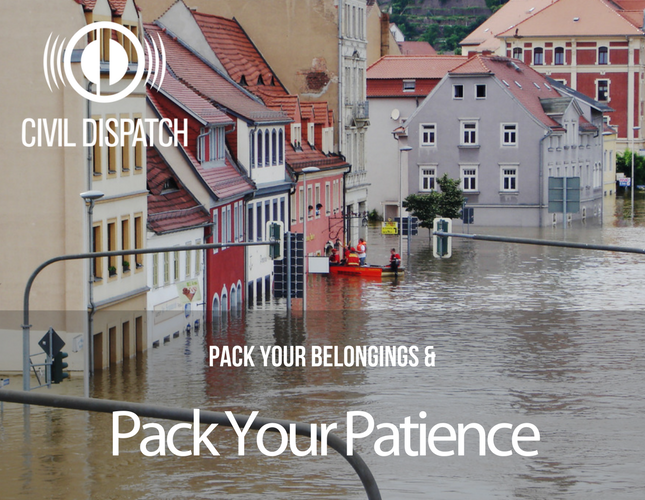 Disasters can be one of the most stressful situations to be involved in, but training yourself to not only pack your belongings and your family but also packing your patience for the long road ahead can make this dark cloud of disaster seem a little bit brighter. Emergency preparedness doesn’t just include having your supplies and plan together, it also includes having a healthy (and prepared) mental state. Understanding how our body reacts to stress and how to counteract those impulse responses are key when safely getting you and your family out of harm's way. First, all of us usually go through a phase known as “normalcy bias.” This phase is a response to help us cope, register, and sort out the events that are going on around us. Humans are naturally creatures of habit, so with that being said getting us out of these phases that we slip into takes a lot longer than getting ourselves into them. After a disaster, things will change. There’s no equation to prepare us for how big or little these changes might be other than understanding how our brains and bodies are going to react. Disasters can inhibit mental reactions such as anger, frustration, confusion, helplessness and physical responses such as shaking, headaches, and heart palpitations that can cloud our better judgment. Control your breathing in stressful situations. Keeping your heartrate low can ultimately keep you more alert and focused. If you find yourself on the verge of losing, stop where you are and collect yourself. Read over the plans that you and your family have worked putting together to prepare you for this exact moment. Have a stockpile of the music that relaxes you the most lying around. Sip on herbal tea or take herbal supplements that are designed to combat stress and anxiety. Get a good night's sleep and take your daily dose of vitamins and nutrients. Another thing that reduces stress is pre-planning for even the smallest of emergencies. Small things happening unexpectedly and not being correctly prepared can induce the greatest amounts of stress. Have a step-by-step plan set up that everyone is on board with. This also includes having emergency numbers handy and having your emergency supplies ready at the drop of a hat. Practice makes perfect, so test out all of the emergency protocols you have set up. Have those emergency numbers programmed in your family members' phones. Prepare for those emergencies that can happen on the go such as a flat tire or running out of a gas. We can only prepare so much for what could happen. This world is very unpredictable and by incorporating this mental aspect into your emergency preparedness plan, these unpredictable moments can become a little bit more predictable with how you react to them. For more information and tips on all aspects of preparing you and your family, check out The Prepper’s Blueprint by Tess Pennington.